Home > Archive by Category "Marketing for Lawyers"
Does My Law Firm Need to Use an Email Signature? We are surprised to see how often attorneys send an email without email signature block. It’s relatively simple to create and append one to all communications. Even when signatures blocks are available, most firms treat them as a formality rather than an opportunity. What do we mean by an ‘opportunity’? A single template signature block is sufficient for providing contact information. However, as attorneys, you know that its purpose isn’t so black-and-white. Consider this: Many messages you are sending to people are either in the interest of legal advocacy, internal firm communications, or attorney advertising. Each scenario requires you to include how to contact you as the sender. However, what if you could tailor your signature for each recipient that met all compliance standards while maximizing opportunities and zero extra effort? It’s not too good to be true. Today’s technology allows you to share the right information at the right time with the intended audience. 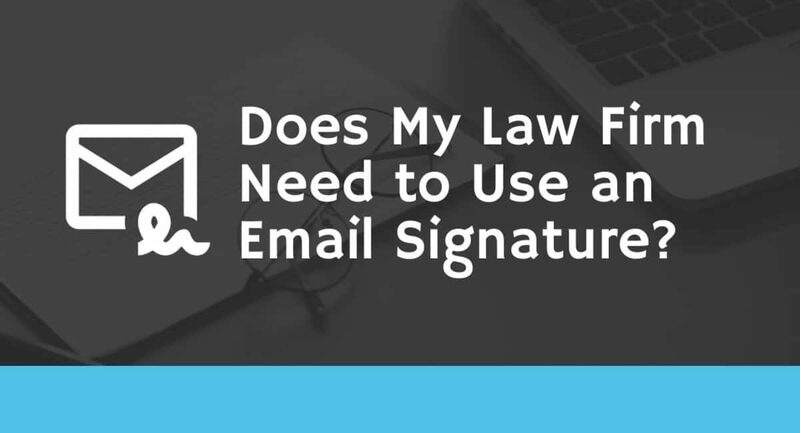 The short answer is “Yes!” Your law firm needs an email signature block on every email. How effective you want to make it is up to you. In law firm’s past, the IT department has been responsible for managing the process of assigning email signatures through internal services. Partners and associates treated the signature block as an ad hoc function at best. The majority of IT staffers enacted a single template for everyone on the system while leaving the individual to create individual customizations from the email client. Let’s say that pre-cloud technology left us all feeling a little uninspired. 1. Disclaimers vary by year, practice area, and department. The fine print of your email signature usually addresses what to do if your email was erroneously received. As you know, that evolves regularly depending upon many factors. Not to mention, networking emails also count as attorney advertising and the language used must be different. Instead of changing these at the local level, IT can now make a firm-wide update from a centralized location. Some larger firms also have wealth management, real estate, and CPA arms that may include attorneys who still practice law. An email signature generator can help your attorneys and staff make it uniformly clear as to where the communication came from and its intent. IT staff members can use email signature generator applications to uniformly update contact information, links, disclaimers, photos, and logos from a single location. The ease of use can minimize real and opportunity costs for a fraction of what updates use to demand. 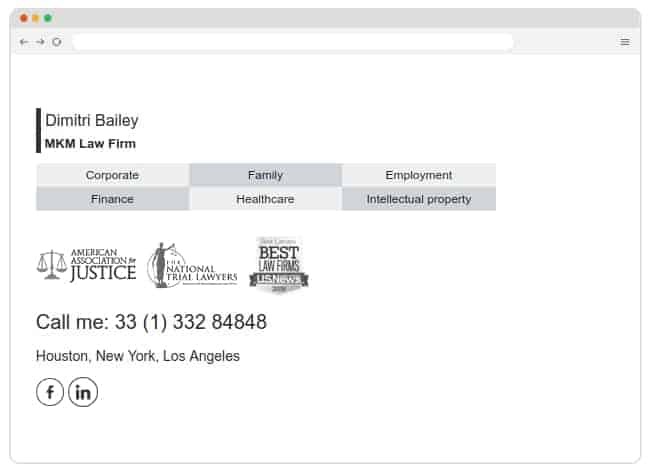 Look at that email signature that your law firm might be using. By now, you have a solid understanding as to why enforcing email signatures for an entire law firm requires a dedicated email signature SaaS. The software allows you to implement multiple variations based on the context, sender, and purpose. Standard email tools are not robust enough to achieve IT’s signature compliance guidelines. Find out why more law firms are choosing Bybrand to elevate their practice through an overlooked strategy. Bybrand is an email signature generator made for IT managers and marketing professionals. The idea is to save you time in managing your team’s email signatures while providing a solid marketing channel. Create a spreadsheet, download a file, speak to a client. Your workers have constant demands on their time. But are their efforts paying off? A time tracking app lets you really dive into your team’s work. If replying to emails is eating up a chunk of everyone’s day, maybe you can find a way to make the process easier or more efficient. There are many different apps on the market. Here are the best time tracking apps that we could find. Time Doctor is particularly useful for people working on remote teams. If you can’t see your employees in front of your face, it can be hard to know what they’re doing. Yet the benefits of a remote working environment are huge. The app allows you to take screenshots of your workers’ devices so you can see if everyone is on task or not. Every boss’s fear is that their employees are slacking off on sites like Facebook and YouTube. If you’re paying someone for their time, you need to know that it’s not being wasted. Time Doctor offers extremely details reports that you can comb through for information. You can get started with Time Clock Wizard for free. It’s very popular because the app has a lot of uses. In addition to tracking employee time, you can also manage employee schedules, operate your payroll, and more. The system allows for instant notifications. If you ever need to look at anything on your account, you can log in on your phone, computer, or tablet. Toggl focuses on freelancers. You can assign one-off or recurring tasks with ease. You can also set reminders for yourself. The basic Toggl plan is $9 a month. You’ll receive a single, annual bill, however, rather than a monthly one. Business owners and freelancers like Toggl because the system is very easy to use. You can create a new project in seconds. Hours can work for any business owner that needs to track employee hours. However, you can only access the system through its own IOS app and its website. It’s less convenient than some of the other options. Hours customers pay $8 a month. There’s also a basic, free version that you can use. Timely record your team’s activity then makes guesses about what you did. If you agree, you leave the record untouched. If not, you can make an edit. As Timely’s system becomes more sophisticated, it’ll become more useful. Each edit is recorded so accuracy is increased in the future. Freelancers pay $8 a month for timely. Teams can access the features for $15 a month. There’s no free plan that you can test out. The best time tracking apps are constantly changing. Old apps are updated and new ones are introduced with regularity. Experiment with different apps until you find one that your team gels with. Our blog is a goldmine for business owners who want to improve their operations. Become a regular reader to stay informed. Attorneys face unique challenges when practicing law. You have to manage client expectations and generate enough clients to pay back your student loans. That’s one of the reasons why lead generation for lawyers is so important. About 75% of attorneys work long hours, and worrying about marketing isn’t high on the to-do list. When you have lead generation working on automatic pilot, you can then focus on what you do best. Read on for the top 7 ways you get your lead generation engine running. Why should you move your marketing online? First, it’s easier to manage and automate. Second, it can complement what you already have coming in through referrals. Third, it’s how people find a new attorney to work with. Your website is going to be the centerpiece of your lead generation activities. When someone visits your site, the idea is to capture their information and build a relationship with them to earn their trust. When you earn their trust, they’ll contact you for a consult or hire you. You need to have a few components in place to make this successful. Your lead generation success will depend on your website’s design. Your site’s design impacts everything from creating the first impression to clients deciding to work with you or not. You want to make sure you get it right with a modern and mobile friendly design. You also need to have forms installed on your site to capture contact information. If you’re working on a WordPress site, this is easy to do by installing a plugin. Most email marketing software out there has a WordPress plugin to make creating a form very simple. The content on your site also has to be geared towards a specific action. In this case, you want them to sign up to your list. Your content should explain the benefits of working with you and why you’re different from the other attorneys in your area. In order to get someone to sign up to your list, you want to give them an incentive. Give them something like a legal guide in your area of practice. That will add value to their lives and build trust. Paid ads can skyrocket the number of leads to your law practice. Pay per click ads on Google can be used to drive traffic to your site. If you’re investing in paid ads, you’ll want to create a separate landing page for lead generation. This will be a simple page with a compelling headline, a small amount of text, and a call to action. You don’t want to direct people to the home page of your site because you’re assuming that they’re just going to call or sign up to your list. You’re giving them an extra step to do. Your job is to make it easy for them to sign up. Local search is increasingly more important for attorneys as more people are turning to Google for advice. With a smart SEO campaign, you can get your practice to the top of search results. That will lead to more traffic and more leads. Search engine optimization can take a while to build up. You can spend money on paid ads while you’re waiting for search traffic to pick up. When it does, then you can ease your PPC spend. A key component of SEO is blogging. You want to update your content regularly to show search engines that your content is relevant. You’re also much more likely to rank for more keywords, improving your chances to be found in search results. One of the biggest challenges of blogging is writing content that people like. One way around that is to make a list of your most common questions and write blog posts around them. You can also follow these tips to become a better writer. Your lead generation campaign will reach full circle through email marketing. Email marketing is a way to automate the follow-up process and stay in front of potential clients. Most email marketing tools offer automated campaigns. When someone signs up to your list, have a chain of emails over the next couple of weeks that introduces your practice. Attorneys largely rely on referrals for new clients. You can continue to generate more leads through referrals when you implement these other tips. When people get a referral from a friend, they’ll immediately look online for additional information. If they can find your information easily through search results, they’ll click through for more information. If your site is updated regularly, that will instill confidence in the person visiting your site and lead them to take further action. All of the lead generation techniques listed above will work for you. The question is whether or not you have the time and resources to devote to building your lead generation machine. If you do, that’s great. If you honestly answer that you would rather focus your attention on your clients, that’s fine too. You’re better off outsourcing your lead generation. There are many companies that specialize in lead generation for lawyers. This site, for example, gives law firms highly targeted leads according to legal specializations. You can essentially skip the steps and get leads delivered to you. Lead generation for lawyers starts with your website. All of your marketing activities will be directed to your site, where they’ll sign up to your list. Once they do that, you have a lead. Then, it’s up to you to close them. If you want to do more to get your name out there, sign up for a free directory listing today. If you’re someone who has caught the reselling bug, you see the potential in it. There’s a lot of money to be made in reselling. With platforms like eBay, Poshmark and Mercari, there’s no way this type of online business building will slow down any time soon. Knowing this, it’s an excellent idea to use a popular social media platform like Instagram in order to build your visibility in the marketplace. There are a few factors that you’ll need to consider when you’re devising a plan to dominate the reselling world on Instagram. There are so many approaches to consider when you’re developing a platform on Instagram to build your visibility for your reselling business. If you’re looking to find people who are interested in buying your merchandise, you’re going to take a different approach than someone who is teaching other people the ease of reselling. If you’re selling merchandise, develop a niche. If you’re reselling fashionable clothing on platforms like Poshmark, you’ll want to produce content that features the clothing. If you’re showing people how to become resellers, you’re going to want to find people who are really interested in entrepreneurship. Additionally, you’re looking for interested people who are looking for an entrepreneurial opportunity. If you’d like to do a combination of both, it’s important to define and finesse your voice. Otherwise, your message might become pretty confusing and hard to follow. Once you define your target audience and your niche, you can begin creating incredible content. When it comes to content creation, it’s always better to stay ahead of the curve. You can do this by being prepared. Sit down to create a batch of content in advance. It’s also a great idea to make sure you use a scheduling tool. With the right scheduling tool, you can upload the content and schedule it in advance. When the time comes, the scheduling tool will pump out the content. Do your research to find out when the best times to post are. If you don’t post at the right times, your content can easily get lost in the Instagram feed. Using the right hashtags is one of the most essential components to help you get in front of new people. Instagram has a special feature that allows you to follow any particular hashtag you want. If you’re reselling a particular brand of discontinued makeup, put the brand name for the makeup in the search engine section of Instagram. The results will populate with the appropriate hashtags that people are using surrounding this particular brand of makeup. Once you start following the hashtag, you can start liking and commenting on the pictures within that subset. As you comment, you can let people know that you sell that particular item. Try to do it in a way that doesn’t come off as spam. You want to authentically interact with people in order to redirect them to your page. Make sure that your photos and videos are up to par. If your pictures are blurry or raggedy, it’s going to portray a level of unprofessionalism. Instead, make sure that you take good-looking pictures. Nowadays, everyone has a smartphone. The cameras on smartphones are impeccable. Whether you use a ring light or natural light, make sure that you find creative ways to capture your content. If you’re reselling designer heels through Instagram, create flat lays and beautiful displays that showcase the shoes. Instagram is a very visual platform. Contact www.magicsocial.net to make sure you don’t neglect that fact. The Stories feature will really help you as you’re working on developing a consistent presence on Instagram. There are tons of people who solely pay attention to Instagram stories. Consequently, they won’t see any of your content that’s on your feed. There’s a sharing button you can use. All of the content you place on your feed can be shared in your stories. Additionally, you can record exclusive content for those who watch your stories. Keep in mind that it’s not necessary to hold the phone up to your face to talk to your viewers each time. There are tons of people who use the stories to share motivational quotes in addition to their business content. If you can strike a balance, that’ll be helpful. Plus, as you use the stories feature on a consistent basis, it helps you to become more relevant to your following. The live feature isn’t everyone’s favorite because it’s almost equivalent to public speaking. However, a live broadcast is helpful because the algorithms tend to give those accounts more visibility. Knowing this, do your best to figure out the best times to go live. If you’re nervous, jot down a few notes so that you can remember what you want to say. Always do your best to provide value so that others will return and spread the word. Online technologies are shaping the world in a better way! And needless to say, it has also impacted and transformed the legal domain as well. Today, students have a chance to be a part of law schools through renowned universities. Hence, both the law firms that are old and new should make the most of the online marketing to draw in new customers and favorably grow the business. It is essential to note that online marketing trends are always being welcomed and then transformed for the better. However, it is essential for companies to stay tuned into the new trends. To know more about this, you can browse through https://atomicdesign.net/rochester-web-design-seo/ and others to learn more. Is yours a law firm? If yes, you can opt-in to use the following internet marketing guidelines to reap the best results. You can divine your online marketing budget in a mix of choices, such as SEO, paid social media, pay-per-click, email marketing, content marketing, and distribution and many more. However, if you go ahead with this without a plan, it will boomerang. So, make sure that you account for all the marketing expense and concentrate all your attempts on the outlets that enable you to calculate success. The moment you can evaluate your marketing data, you will know precisely where a new customer walks-in at an optimum cost. Your task is to increase these winning and favorable campaigns. Your firm will experience significant growth in this way. Social media is here to stay for the longest time! This platform offers you plenty of attention from your customers. And you can plan the way you want to capture the same. Today, Facebook has as many as 1.39 billion monthly users, and the majority log in on a daily basis. The new age targeting choices Facebook comes with, enable users to place the ads to the notice of an audience that you want to. It will help you enhance your local online marketing activities. You can also put the ads in front of those customers who require your law firm’s service more. It is a smart call to operating an online marketing campaign that addresses the chosen law services your firm provides to create leads. Furthermore, you can use this campaign to develop more awareness within the local community. The successful online marketing campaigns that bring increased traffic to your website are a part of the job! The moment the web traffic is on your law firm’s website it is essential for you to create conversions, through either a lead submission form or via an incoming call at your law firm. A high-quality, informative and value-driven blog is the apt place to start! So you can think of coming up with informative eBooks as well as case studies, that talks about your law firm’s know-how and expertise. It’s best not to make them a part of any promotional ads. Hence, make sure you highlight your firm’s salient points in the form of resourceful content. Offer total value and watch all your leads walk-in favorably. Surprisingly, there are legal firm websites that are still not mobile-friendly! And this is a considerable set back considering Google’s mobile first index which has become functional. When your site is mobile-friendly, it scores better results on online searches and also provides an improved user experience. You might have a team of successful and trained lawyers. However, if people find that your website is not easy to navigate from their Smartphone devices, they wouldn’t browse through your site and get to know the services and attorneys your firm specializes in. So, is your website navigation smooth? Are the online submission forms simple to complete? If not, then you need to work towards it and ensure your website is mobile-friendly. You can add paid traffic with pay per click advertising an Orlando PPC ad agency. When a person submits an online form on your site, chances are they require an attorney urgently! While the other industry verticals can afford to have a slow follow-up, for instance, 15 days and the like, your law firm should have regular follow-ups. Hence, it’s a smart call to create a lead nurturing campaign that instantly sends email to their leads, after a submission to provide with a consultation call on the venue completely free of cost. If you miss doing this, chances are the lead will shift to another market player or your competitor before you get to address their requirement. It is essential to know that not every lead will respond to your initial offer. Hence, make sure that you send an email within 24 hours of the follow-up. Today most law firms don’t make use of the best benefits of internet marketing! If you want to make the most of online marketing, you can opt-in for the above discussed online marketing strategies and witness the positive differences that it brings about. Are you a lawyer? Did you slave away reading mind-numbing books incessantly for seven more years after you graduated from high school? Then, you should be able to write well. However, if you are in the minority and still haven’t figured out to write well, then this is for you. Maybe you should use a writing service. Maybe you might be interested in an American or UK law essay writing service? If you can’t write well then you should try some kind of other dwellings, or you can read this spelling, from a writer who writes well. Legal Blog Posts Need to Answer the Question of Why? Because you know you are a sub-par writer, you know that you should be better. You understand the fact that you’ve probably pissed away a lot of money on and Education that you obviously haven’t utilized. And what is that all about? You should dig into this thought process and or what transpired to make it happen. There is one problem. You might find yourself on your knees screaming at the sky. Answering the question “why?” isn’t always an easy task, especially if you squandered cash on a matriculation process that didn’t work out. If that’s the case, then read on. OK, so you’ve passed the bar and you’re ready to actually learn something. You’ve jumped through (and survived) all the hoops. Now, what are you to do since you don’t write well? Writing is a paramount art and an important part of life. The best thing you can do is start writing. Just write the word you see in your mind, and if it’s the same word keep writing it until you hear another word or see another word in your mind. Don’t try to be rude or simply kind, just write the word you see in your mind. And after you start writing words and phrases and thoughts that aren’t blind, then maybe it’s time to remind. Remind yourself why it is you can’t well write. After you’ve learned to unwind, it’s finally time. Write down 3-5 talking points. What is the message you want to convey? What are the points you are wanting to make? Raise some questions to the reader. After that, answer them or expound on the line of questioning. Now you will be on to something. What makes a good bullet point, you might be asking? A good bullet point is something that not only informs and gives a reason for the information it spews, but it makes a person think. One that makes a person ask other questions while providing pertinent information. In conclusion, you should end your article, or piece, summarizing the meat and the core of the piece once more. After you summarize then you should pose a question. This is a great way to keep the conversation going, and growing. If you run a business these days, being ranked at the top of the lawyer SEO list is one of the most important keys to your success. Having the right keywords embedded into various search engines is not only paramount, it’s imperative. When you are a lawyer it’s even more important to have your firm’s’ name out there, since your ideal is to help citizens attain a fair or at least somewhat fair trial. 96% of people that are seeking legal advice are doing so through a search engine, so here are some tips to get your name out there. Pinpointing the best keywords that will create the greatest flow of traffic to your site is the first thing you should do. Knowing your audience and obviously knowing your craft are the two components that will bring success to your SEO plans. After you have chosen the optimal keywords that should make you a player on the web, you now need to confirm that you are getting the traffic you deserve. Keeping up with the trending keywords should be a part of your job description in the year 2018. This will allow you to know what is and what is not working and or getting your law firm ranked at the very top of people’s searches. You not only need to know your “stuff” you also need to have a website with credible and readable, interesting, eye-catching content. These are the adjectives you should be striving for. You also should be ready to back up the claims you make within your content. Put your mouth where your money is, and mean it. Procuring the right inbound links can make or break your business. If you are dialed into the correct keyword links that will bring a tidal wave of traffic to your website and law firm, you’ll reap the rewards not only financially but in how many people you can help to get a fair shake with the law and the powers that be. Taking stock of your progress will help you measure whether or not you’re using the right words in your placements. There are so many things in life that we can’t control especially when it comes to running a law firm. Being on top of your search relatability is something that you can control, and it is something that will make or break your success in the industry. You got into the world of law for important reasons. You don’t want those reasons to go unfounded and have your firm be lost by the wayside. So take the proper steps to assure your presence with the online marketplace for those in need of a law firm to represent them. You hear it all the time, how every business needs to have a blog and an inbound marketing strategy. Cries of “content is king!” and other common sayings about SEO and marketing spin in your head, and you can’t imagine where to begin, let along why your law practice might need a blog at all. The answers are simple and yet more complex than you might imagine. The simple answer is that the more potential clients can find you in relevant searches, especially local ones, the more likely they are to hire you. The more complex answer is that the larger your digital footprint, the more likely you are to be found in searches. The conversion rates (searchers into actual clients) rises significantly with higher search engine rankings. Besides that, searchers that you help with great blog content are more likely to choose your law firm for their legal needs. Here are five reasons your law practice absolutely needs a blog. Go ahead. Google DUI attorneys in your area. Or whatever your law niche is. We’ll wait. Is your name in the first page of results? Second? Where do you rank in that first page? Now perform the same search on your mobile device. What did you discover? Unless you are on that first page, clients are not finding you through the web, and studies show that most searches start on mobile devices and end with customers calling one of the top ten search results (that is not an ad) first. If your name is not on that list and your competition’s name is, you are losing business to them in the digital sphere. Now, take a look at the websites of the top five search results. You don’t have to dive really deep here, just note one thing. Odds are those sites have a blog or have other content that websites are linking to and building their authority. Yes, content and link building still matter for search engine ranking, and if you are not doing anything about it, your competition is. Often it is hard for more traditional businesses to understand why online search matters so much, but many potential clients search for and find the law firms who represent them on the internet, and if you are not there, you are missing out on clients and leaving money on the table. Secondly, online search allows you to rank for certain questions, questions potential clients may already be asking you on a daily basis. Answering them online ahead of time in a way that ranks in search engine results pages (SERPS) will lead them to you faster, and will also lead to more clients who may currently be finding those answers from other websites like those of your competition. Simply put a law practice without a blog and a digital presence is sacrificing clients to those who do. Imagine you are a DUI attorney in Phoenix, Arizona. Your competition has a blog that offers advice about when to contact an attorney in the case of a DUI and things to do and not to do when it comes to facing charges in court. Even if both of you have prominent billboards in strategic areas, the practice with the blog that answers searchers’ questions will be more profitable and win more clients. Those potential clients might see and recognize your name, but what they find on the web will sway their decision about who to hire. Local search results matter a great deal. Most searches start on mobile devices and potential clients are looking for attorneys near them with the type of specialty you practice. Google as launched a couple of initiatives like the Accelerated Mobile Pages (AMP) project and the Mobile First search initiative. The way your listing appears in local searches matters to potential clients and appearing in the first three to four listings displayed will increase your conversion rate from the web exponentially. This means it is also important to keep all of your business information up to date on Google and other search engines, including contact phone numbers, email addresses, and the hours your practice can be reached. Neglecting any of these things will literally drive your potential clients to the arms of your competition. Having a blog that explains what they can expect of you and sets you apart from your competition will set up your practice for even greater success. How are you going to get the word out about your law practice? Word of mouth is still the most powerful form of advertising, but now clients have a megaphone and will tell hundreds, sometimes thousands about your business rather than simply 10 close friends at a party. Social media is the new word of mouth, and your blog gives those who would share about your practice something to talk about. This is why not only having a blog but the content of your blog matters so much. Answer the questions your clients are asking. Offer free advice that illustrates the client’s need for an attorney to protect their rights. Give potential clients what they want that will inspire them to call you before anyone else. This means sharing success stories, talking about changes in the law, and many other topics. The more relevant the post, the more likely a searcher will share it on social media and tell their friends and followers about it. Posts that are evergreen—in other words, ones that address an issue that is common over a long period of time—perform even better. You may have heard of content marketing and how inbound marketing is where the future is headed but may not have adopted it yet. Your law practice needs a blog just like any other business does. What you do with that information may lead to your success or failure as an attorney.